– First to observe and document the metamorphosis of a butterfly. – One of the most significant contributors to entomology. – Was an accomplished botanical artist. 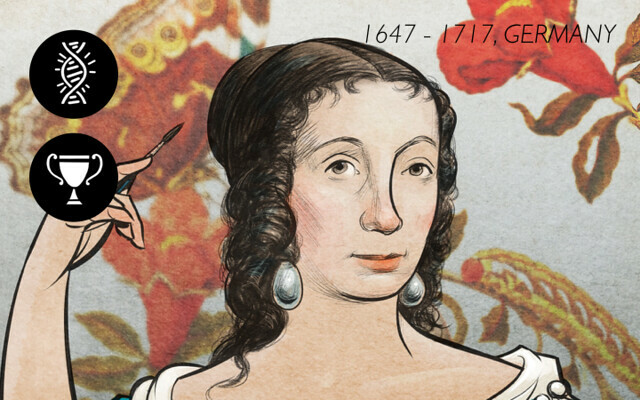 Maria Sibylla Merian (2 April 1647 – 13 January 1717) was a German-born naturalist and scientific illustrator, a descendant of the Frankfurt branch of the Swiss Merian family, founders of one of Europe’s largest publishing houses in the 17th century. Merian received her artistic training from her stepfather, Jacob Marrel, a student of the still life painter Georg Flegel. She remained in Frankfurt until 1670, relocating subsequently to Nuremberg, the small village of Wieuwerd in the Dutch Republic (1685), where she stayed in a Labadist community till 1691, and Amsterdam. Merian published her first book of natural illustrations, titled Neues Blumenbuch, in 1675 at age 28. In 1699, following eight years of painting and studying, and on the encouragement of Cornelis van Aerssen van Sommelsdijck, the then-governor of the Dutch colony of Surinam, the city of Amsterdam awarded Merian a grant to travel to South America with her daughter Dorothea. Her trip, designed as a scientific expedition makes Merian perhaps the first person to “plan a journey rooted solely in science.” After two years there, malaria forced her to return to Europe. She then proceeded to publish her major work, Metamorphosis insectorum Surinamensium (de), in 1705, for which she became famous. Because of her careful observations and documentation of the metamorphosis of the butterfly, she is considered by David Attenborough to be among the most significant contributors to the field of entomology. She was a leading entomologist of her time and she discovered many new facts about insect life through her studies.